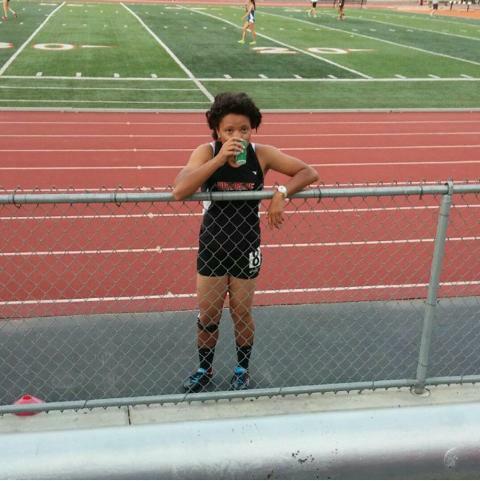 Eishale Pierson, member of the Track and Field Team at RCC takes a break during her track meet. Fitting in. Getting involved. Finding one’s self. These are the thoughts of college students trying to get involved with school activities. Students in college have at least one goal on their mind: being able to have a fun college experience. One activity that students can get involved in is school athletics, and Eishale Pierson did just that. She is involved in basketball and track and field at Riverside City College. RCC student Schuyler Gage is involved in the dance program. “They keep me coming back to school and have helped me plan for my future, like transfer programs,” Gage said. Students can get involved in multiple clubs like Laura Bayona, who is in the Art club and a Christian club on campus. “These clubs have indeed made an impact on my life because not only have I learned a lot about a certain subject that I love, but especially because I have met a lot of people and made a lot of friends that have similar hobbies and beliefs of mine,” Bayona said. Male students, such as Miguel Hernandez, get involved in school activities as well. “I am involved in sports, particularly track and field and cross-country,” he said. These students believe that their lives would be completely different if they didn’t get involved in school activities. For Pierson, she looks at her involvement in school from an athlete’s perspective. “I wouldn’t know where I would be talent wise in sports and I wouldn’t have been able to travel to such amazing places and get the full experience like pro athletes do,” she said. For Bayona, being involved in clubs has helped shaped her into the person that she is today. “I think that if I wasn’t as involved in school activities, I wouldn’t have met so many great people and made great connections that have helped me throughout my educational career,” she said. Gage decided to throw in some humor into what her life would be like without being involved in school. “I would probably be working at a dead end job hating life,” she said. So why did these individuals decide to join these particular activities to begin with? For Gage, she was getting reckless in her academic classes, so she needed to move. For Hernandez, his life would not be as active if it weren’t for sports. “My life would have been not as active as I would like it to be if I were not involved in such sports activities,” he said. Students not involved in any clubs are missing out on making college one of the most memorable experiences of their life. These activities can allow a person to make many friends and make connections that they may be needing in the future. A person can get involved in a sport like Eishale Pierson, Schuyler Gage and Miguel Hernandez did. A person may want to get in clubs such as the Art club and Christian club like Laura Bayona. A person may choose to not get involved at all. Getting involved, however, may be the key to finding one’s self and make an impact not only in that specific person’s life, but making a difference in other lives too.